Milwaukee Brewers reliever Josh Hader‘s fastball has been unhittable this season. Cincinnati Reds catcher Curt Casali hit a double on the sixth one he saw Monday night in the ninth inning, then watched Hader mow down the Reds’ next three batters with 10 more. So far, he’s the only one. Hader has allowed just one hit in three games this season, but his performance against the Reds was actually a step back. 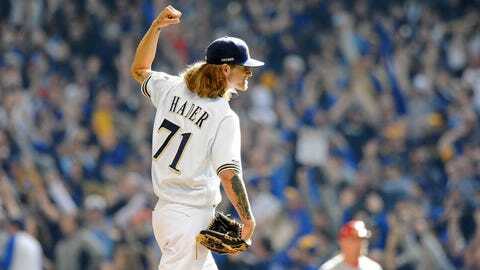 He delivered a so-called “immaculate inning” Sunday in the Brewers’ 4-2 win over the St. Louis Cardinals, the first by a Milwaukee pitcher in nearly half a decade. Hader was dealing against the Cardinals, revving his fastball up to 98 mph while striking out Tyler O’Neill, Dexter Fowler and Yairo Munoz on three pitches each. Such innings were rare once upon a time — the majors went more than 20 years without one from 1928-53 — but have become much more common over the last several decades. There were eight in 2017, and four in 2018. Still, it’s the first immaculate inning since last August, and the first by a Brewers pitcher since Mike Fiers on May 7, 2015. Hader has thrown 46 pitches in three appearances so far this season, all of them fastballs, most of them strikes, averaging 95.5 mph. He’s up to 28 swinging strikes (plus two looking), 11 balls, five balls in play and just one hit so far, with eight strikeouts. That fastball isn’t the only pitch in Hader’s arsenal, even if he’s leaning on it early. Hader threw 1,016 fastballs last season, but mixed in 272 sliders, 23 sinkers and five changeups as well. Eventually, he might even need to use them.